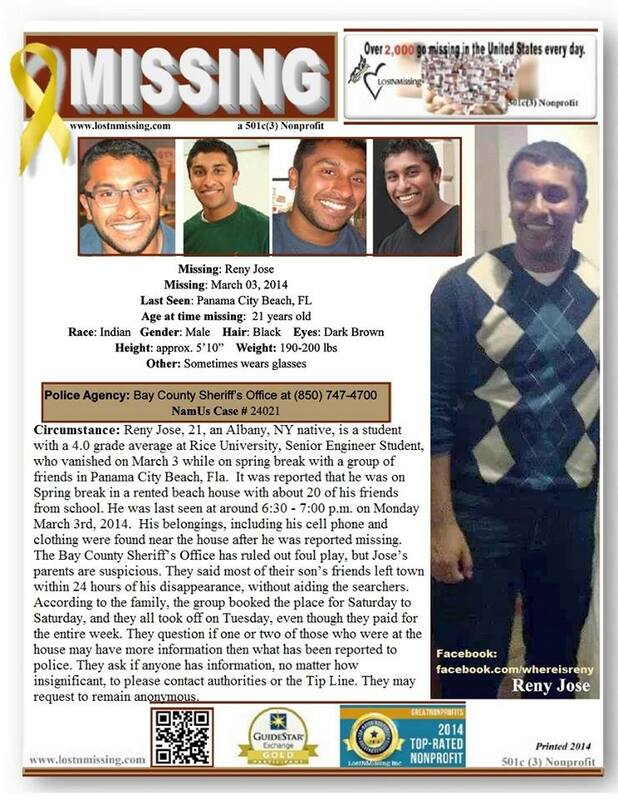 Reny Jose went missing on March 3rd, 2014 from Panama City Beach, Florida around 6:30pm. He was on spring break with 22 of his friends from Rice University at the time. They rented a beach house for the entire week on the 21,000 block of Front Beach Road. Reny was reported missing on March 4th around 11:00 am by his friends. These friends later phoned authorities stating that Reny’s clothing and belongings were found in a trash can behind the beach house around 11:30am that day, just hours after beach clean up patrols the beach. Reny’s family was notified of his disappearance on Tuesday, March 4th at 3pm and arrived in Panama City Beach on Wednesday, March 5th at 11:00pm. At that point, they were notified that 16 of the students on the trip had already left. When asked if all of the students had been interviewed, the Sheriff’s office insisted that interviews had been conducted and that transcripts would be provided. The transcripts that were later provided indicated that not all students were interviewed and that most were conducted via phone on Wednesday, March 5th (after the family requested to see the transcripts). The family was told that the students offered no significant information to guide the search efforts. And when the family arrived, no active search was going on. After contacting NYS politicians, on Wednesday evening and releasing a press release regarding the lack of search efforts, the search picked up on Thursday, March 6th (72 hours after Reny’s disappearance). These efforts included helicopters, dive teams, and the Coast Guard. To date the circumstances of his disappearance remain a mystery. Due to the location of the beach house, the search was highly focused on the Gulf of Mexico, although there is no real indication that Reny went into the water. Reny is a very intelligent, happy go lucky and loving individual. He was due to graduate from Rice University this past May with honors in Mechanical Engineering. The family is actively seeking assistance from the FBI due to the fact that Reny was born and raised in New York, went to school in Texas and went missing in Florida. They are requesting support from Attorney General Eric Holder and Senator Charles Schumer in order to obtain this assistance. Please take the time to sign and share the petition links posted on this page. EVERY signature makes a difference! And as always, keep hope alive!